The ear is the organ found in animals which is designed to perceive sounds. Most animals have some sort of ear to perceive sounds, which are actually high-frequency vibrations caused by the movement of objects in the environment. The human ear picks up and interprets high-frequency vibrations of air, while the sound-sensing organs of aquatic animals are designed to pick up high-frequency vibrations in water. Most vertebrates have two ears: one on either side of the head. In some animals, including most mammals, the ear is also used for balance. In humans, the inner ear contains parts called the semicircular canals, where otoliths – tiny stone-like structures – shift in response to gravity and the movement of our body. By sensing the movements of these stones, the ear can tell our brain where we are relative to the directions up and down, and how our body is moving or accelerating. It is these signals sent to our brain from the ear which allow our eye muscles and other muscles to compensate for the small movements our body makes. In this article, we will focus on the structure and anatomy of the human ear. Just as the eyes turn certain wavelengths of light into images, so the ear turns certain wavelengths of vibration into sounds. The outer ear, which includes the complex shell that is the visible ear we see on the outside of our heads. This outside structure, called the “pinna,” acts like a satellite dish or funnel, gathering and focusing sound so that we can hear better. The pinna is made mostly of cartilage. In some animals, this outer “shell” or “dish” can actually move, rotating enable it to collect sound from different directions. Some breeds of dogs and cats maintain this ability to move their ears to better focus on a sound without moving their whole head. Humans have largely lost this ability, our ears being firmly fixed to our heads and without much range of motion. But a few of us can still use vestigial muscles we inherited from our animal ancestors to wiggle our ears! The middle ear consists of a series of bony tubes, which contain other bones that are designed to amplify vibrations they receive through the eardrum. This “eardrum” also called the “tympanic membrane,” vibrates in response to the sounds that enter through the ear canal. 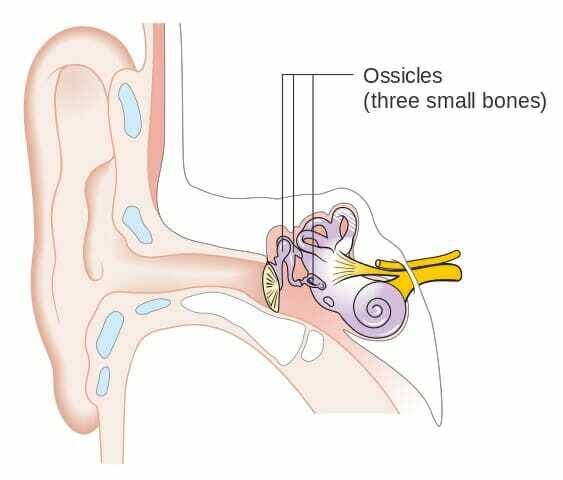 Its vibrations are then transmitted through three tiny bones known as the “ossicles.” These are the malleus (also known as the “hammer”), the incus (also known as the “anvil”), and the stapes (also the “stirrup”). Unlike most bones which are used for structure and protection, the function of these three delicate bones is to vibrate as much as possible in response to sounds that enter the ear. They concentrate the vibrations from the ear canal and transmit them to the inner ear, where these vibrations ultimately reach the cells that send impulses to the auditory nerve. The inner ear contains a series of fluid-filled chambers, which use hair cells to convert fine vibrations into neural impulses for purposes of both hearing and balance. The inner ear receives vibrations that have been amplified and transmitted from the ear canal and through the malleus, incus, and stapes. Located deep within the head, the hair cells of the inner ear are just what the name suggests: fine cells, shaped like hairs, which are extremely sensitive to vibration. When these hair cells are bent by vibrations, special proteins in the cell membrane cause the hair cells to create electrochemical impulses, very like nerve impulses, which are then carried to the auditory nerve in the brain. By determining which hair cells are bending in response to vibration, the brain can calculate with a high degree of detail and accuracy the “pitch” or frequency of the sound vibration; the volume; and the location of the sound. Today, modern medicine allows many people with malformed or damaged cochleas to hear better using devices such as cochlear implants, which artificially produce electrochemical impulses that our auditory nerves can understand. We will talk in more detail about these parts of the ear in the “Parts of the Ear” section below. Within the parts of the ear known as the semicircular canals, hair cells just like those used for hearing have been adapted for a different purpose. This is called the “vestibular system,” and it assists with vision and balance. In the semicircular canals, these hair cells respond to the movement of otoliths – tiny calcium carbonate crystals which can shift in response to gravity and motion, causing them to press on hair cells and release nerve impulses. By using these nerve impulses to track the position of the otoliths, the brain can tell which way is up and down relative to the position of the body. It can also tell which way the head is moving relative to the outside world. Most of us take this remarkable ability of the inner ear for granted, but anyone who has had an inner ear infection – in which viruses or bacteria can temporarily disrupt the balance signals going to our brain – knows how crucial these signals are. When the activity of the inner ear is disrupted, our eye muscles are unable to instinctively adjust to our the movements of our heads. This results in the illusion that the world is unstable, and that it spins when we move! This happens because, without the input from our vestibular system, our eye muscles do not “know” that they have to follow objects in the environment when our heads move. People with inner ear problems also have problems coordinating their muscle movements to keep their weight balanced. Many have problems walking without falling or running into walls, and may experience motion sickness-like symptoms such as nausea and vomiting. Fortunately, most inner ear infections are only temporary. They may last a few days or a few weeks – just enough to help us appreciate the actions of these remarkable organs! The pinna is the outer, visible part of the human ear. Its curves and folds are specially designed to gather sound from the environment and funnel it into our ears. People with pinnas that have been damaged can still hear, but typically do not hear as well as people with intact pinnas. The stiff, rigid parts of the pinna are made of cartilage, just like our noses. The soft, malleable “earlobe” is made of fatty tissue. Some people can still wiggle the external parts of their ears using muscles which our ancestors may have used to rotate our ears to better gather sound from different directions. The opening in the center of the pinna is the opening to the ear canal, which will be discussed next. The ear canal is the opening through which sound waves enter the middle ear. It serves to further focus and concentrate the vibrations collected by the pinna, ensuring that the vibrations will be clear and strong enough to be amplified and turned into nerve impulses. The ear canal is only 2-3 centimeters deep – a little bit less than one inch. About an inch inside ear canal, the tympanic membrane, or the “eardrum” is found. This is why it’s important not to stick anything into your ears; damage to the delicate tympanic membrane can result in impaired hearing! 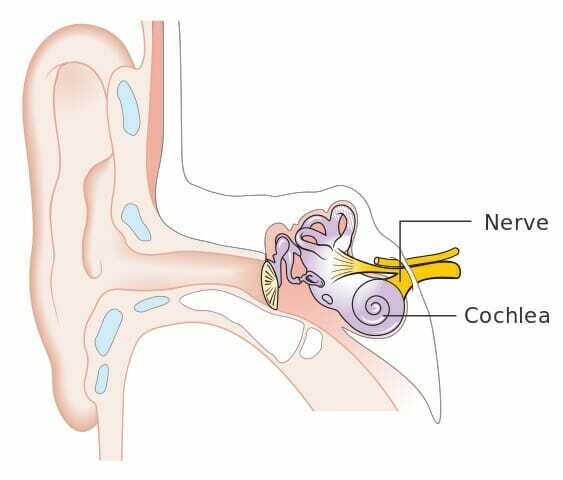 The tympanic membrane, or “ear drum” is a thin, tightly-stretched membrane that separates the outer from the middle ear. Just like the membrane of an actual drum, the tympanic membrane vibrates in response to the sounds that are funneled to it by the pinna and ear canal. The outside of the tympanic membrane faces the ear canal. Its inner surface faces the malleus, incus, and stapes, which act to further focus and amplify the vibrations that the tympanic membrane receives. They are precisely shaped to vibrate in response to the movements of the tympanic membrane – and to transmit and focus those vibrations so that they become even clearer. These bones contact the eardrum, or tympanic membrane, on the outside of the middle ear. They then transmit its vibrations through their specially-shaped bone structures and ultimately into the oval window. When you read about the oval window below, you’ll see why the actions of these bones is so important to the process of hearing! The oval window is a small membrane which lies at the border between the middle and inner ears. 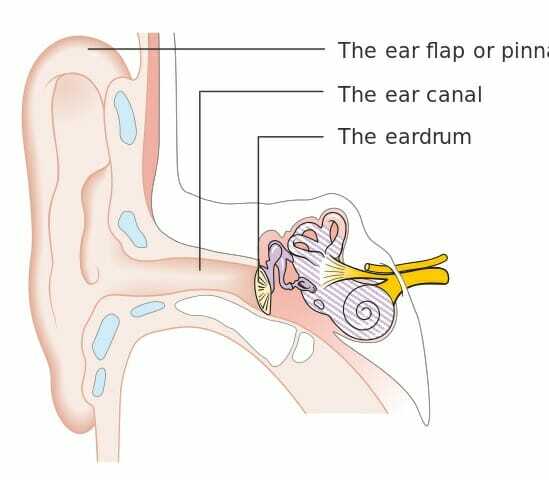 Just as the tympanic membrane receives vibrations from the ear canal, the oval window receives vibrations from the malleus, incus, and stapes. However, there’s a very important difference between the oval window and the tympanic membrane. The oval window is much smaller than the tympanic membrane – and the purpose of the malleus, incus, and stapes is to focus sound vibrations so that this much smaller surface area receives the full force of the vibrations from the tympanic membrane. It’s a similar principle to focusing light from a large lens to fall on a tiny area: the resulting light is much more intense, and you may be able to see much more detail as a result. The vibrations that the malleus, incus, and stapes transmit to the oval window can be twenty times stronger than the vibrations they received from the eardrum! The oval window’s vibrations are transmitted directly into the cochlea, where sound vibrations are turned into nerve impulses for the brain to interpret. When hair cells are bent due to vibration of the fluid in the cochlea, the bending of the cells causes proteins called mechanically-gated ion channels to open. These ion channels allow positively charged particles such as potassium and calcium to enter the cell. This movement of charged particles across the cell membrane is quite similar to the firing of neural signals, or “action potentials,” by neurons cells. Indeed, the movement of ions across the hair cell membranes cause electrochemical signals, which are ultimately sent to the auditory nerve. The auditory nerve then carries these signals to the brain, which analyzes information about which hair cells are being vibrated and turns this information into the experience of sound. Just like cone cells in the human eye respond to different wavelengths of light, allowing us to see different colors, hair cells in the human ear can respond to different frequencies of sound. This allows us to distinguish the pitch of a sound. The semicircular canals are similar to the cochlea in that they are bony canals which are filled with fluid and lined with hair cells. However, the hair cells in the semicircular canals are used for a different purpose from those in the cochlea. Instead of being turned into the sensation of sound, the signals from these hair cells are turned into information about movement and balance. The hair cells of the vestibular system, or balance system. do not receive vibrations from the ear canal. Instead, they are bent by the movements of otoliths – tiny calcium carbonate crystals found within the semicircular canals. Just like stones settle to the bottom of a river or lake, otoliths settle to the bottom of the semicircular canal. Of course, unlike a river or lake, our heads move quite a lot, which causes a jostling of our “stones.” The direction of settling of the otoliths, then, tells us which way is up, and which way our head is moving. Our brains use the signals from these hair cells to automatically adjust our movements. These movements include the movements of our eyes, which allow us to maintain a stable image of the world, even when our heads move; and the movements of our arms and legs, which are fine-tuned to keep us standing upright on two legs. However, when the signals from the semicircular canals are disrupted, people notice very fast. Inner ear infections which temporarily disrupt these nerve signals render our eyes and bodies unable to automatically adjust for the movements of ourselves and our environments. As a result, people with inner ear infections can experience dizziness; the illusion that the room is “spinning” when they move their head; and a “shaky camera” effect where their vision wobbles with every small movement of their heads. These people can also experience symptoms of “motion sickness” such as nausea and vomiting. Fortunately, our semicircular canals work most of the time! Most inner ear infections last only a few days or weeks – just long enough to remind us of how amazing our bodies really are. 1. What might explain the shape of the “pinna,” or the visible, outer part of the human ear? A. The cup-like shape is left over from ancestors who could move their ears to focus sound. B. The pinna acts like a funnel or satellite dish, gathering sound and directing it into the ear canal. C. The cup-like shape is a freak mutation that occurs during embryogenesis. B is correct. The cup-like outer part of the ear gathers sound and focuses it toward the ear canal. 2. What is the function of the bones of the middle ear? A. They have no function; they are vestigial. B. They serve to support and protect the middle ear. C. They amplify vibrations from the ear canal and transmit them to the inner ear. C is correct. The bones of the middle ear are designed to be very sensitive to vibrations. Almost like tuning forks, they amplify vibrations and then transmit them to the inner ear, where the vibrations are turned into neural signals for the brain to interpret. 3. Which of the following could NOT occur as a result of damage to the inner ear? A. The person may become unable to hear. B. The person may become unable to keep their balance. C. The person may get dizzy and feel as though the room is spinning when they turn their head. D is correct. All of the above are possible when the mechanisms of the inner ear is damaged. Fortunately, modern science has allowed for the creation of cochlear implants and other prosthetics that can help some people with inner ear damage to hear. Standring, S. (2016). Gray’s anatomy: the anatomical basis of clinical practice. Philadelphia: Elsevier Limited. Neuroanatomy 2nd Ed Neuroscience 4th Ed. (2009). Sinauer Associates Inc.